I’ve been working with Lookup and Managed Metadata fields lately and ran into some interesting conversations about these today that got me looking close enough to discover some tidbits you may not be aware of. First of all, thank you to Wictor Wilén for his blog covering a Twitter conversation initiated by Fabian Williams. I stumbled across Wictor’s blog entry because I had ran across the TaxonomyHiddenList when doing a search for lists in which a certain domain group had been given permissions (long story). Having not seen the TaxonomyHiddenList before, I was trying to find out more about it. Wictor points out that Taxonomy fields (such as Managed Metadata fields) are Lookup columns. This is how the TaxonomyHiddenList ties in. In my case, I have a rather large Taxonomy (4,000+ terms) and got to wondering if there may be usability or performance issues associated with such a large group. That led me to an MSDN Forum question titled “Lookup column Dropdown or Picker” (my response to which may be what led you to this blog entry). 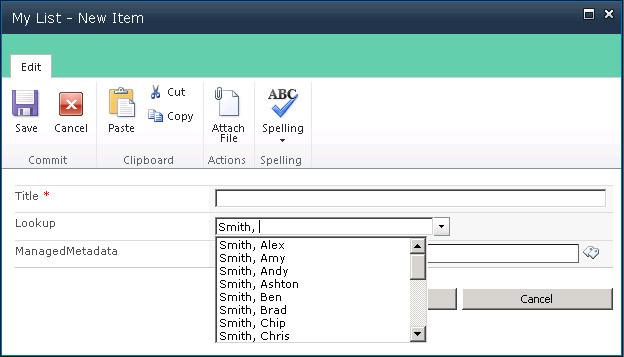 In the question, Mark van Eijk and Clayton Cobb discuss how nice it would for 2010’s RTM to have a dropdown or picker for Lookup fields. Well, we’re all in luck! As it turns out, it appears Microsoft was listening. I’m finding an asynchronous dropdown list of matching values when typing into a Lookup field in NewForm or EditForm with SP2010 SP1 June 2011 CU. Not sure when this functionality was introduced, but I was very pleased to discover it! 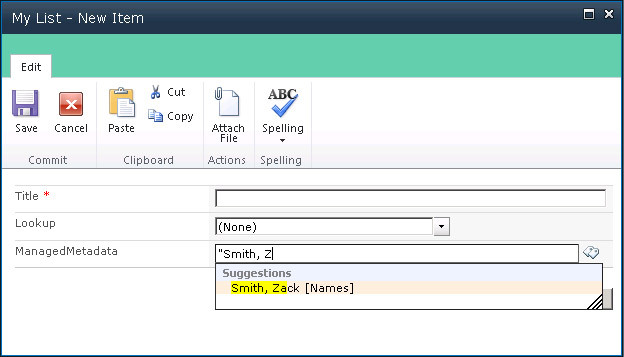 Figure 1: Lookup's asynchronous suggestion dropdown. 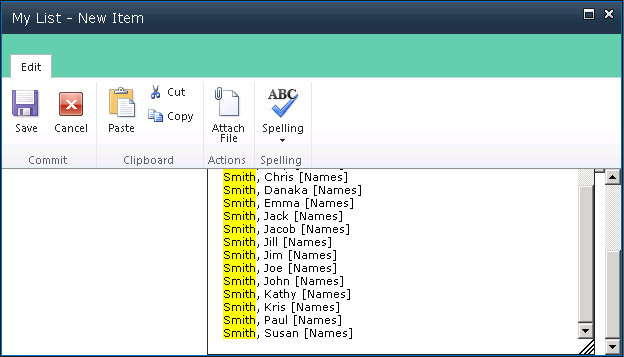 Figure 2: A comma is recognized as a delimiter in the Managed Metadata picker. 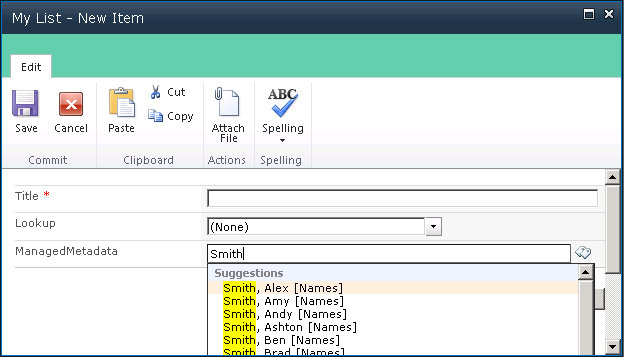 Figure 3: Commas are not a problem for the Lookup editor. Not good when your terms contain commas. To make matters worse, the Managed Metadata field will only return up to 20 matches (compare Figure 1 and Figure 4). Figure 4: Managed Metadata will only return up to 20 matches. Unfortunately, you also end up with a double-scrolling issue when you are using the modal dialogs and your Managed Metadata field is near the bottom of the editor dialog. Though, in all fairness to the Managed Metadata field, this also a problem when the Lookup field is near the bottom. Figure 5: Double-scrolling when field is near bottom of modal dialogue. If you need to use a Managed Metadata field—which I did because it gives the users a quick and easy way to add to the data set (i.e. Term Set)—there is a way for users to work around the comma problem. Here’s what the user needs to do: When typing in the Managed Metadata field to select a term, simply type a quote(‘”‘) first. 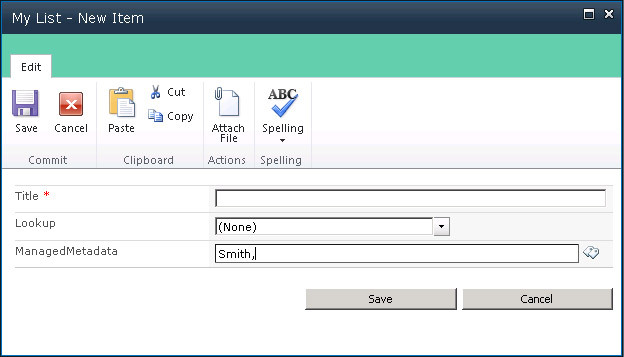 Figure 6: To access a term with a comma, simply type a quote first. Viola! Zack gets some recognition. Unfortunately, typing a quote first is not very intuitive. I kind of stumbled upon it after I saw the Picker surrounding the name with quotes.